Helen Deming will tell you it’s never too late to finish what you started, even if it takes you a few decades to do it. 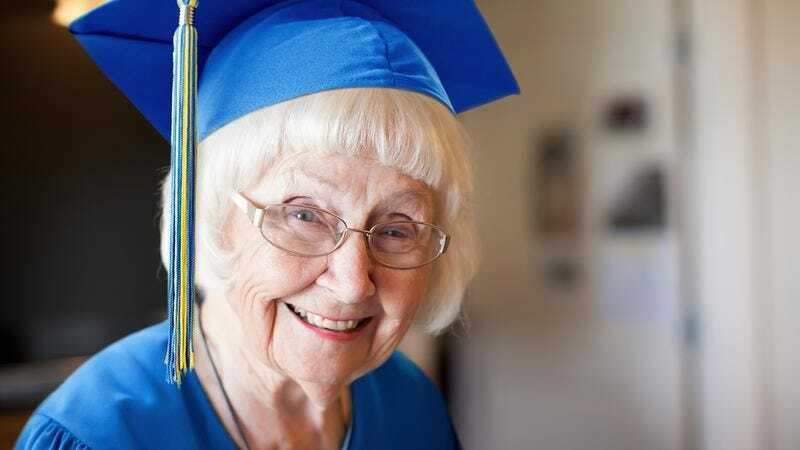 After more than 75 years, the 95-year-old woman finally received her college diploma and is moving back in with her parents while she figures out her next step. It’s official: Age is just a number! Deming had to put her education on hold back in 1940 after getting married and having twins. Now, after receiving her bachelor’s in psychology from Loyola University, her lifelong dream is complete, and she’s back in her childhood home, saving a little money until she can find a job or maybe apply to grad school. It’s been a long and winding road, but after 77 years, Deming is finally sitting pretty in her parents’ basement with a hard-earned college degree, proving that anything is possible. “They won’t be around forever,” Deming added. Deming is a living testament to the old saying “if there’s a will, there’s a way.” As her diploma—now framed and basking in the glow from her parents’ basement awning window—shows, dreams never expire.